Vietnam was the fifth most optimistic country in the world in the second quarter of this year, a notch lower than in the previous quarter, experts said. The downtrend was due to decreased positivity about job prospects and perception of time to buy. However, Vietnamese consumer confidence remained stable in the second quarter with an index score of 120 percentage points, according to the latest issue of The Conference Board Global Consumer Confidence Survey, in collaboration with Nielsen, a global information and measurement company. The level in Vietnam remains on par with that of the second quarter last year, well above the global average and the neutral threshold. The country has been at its highest level for the past two years, according to Nguyen Huong Quynh, managing director of Nielsen Vietnam. “The upward trend in sentiment observed in the last couple of quarters, coupled with the continued improvement in key economic indicators has led to the growth of some categories such as travelling, out-of-home activities and the latest technology,” Quynh said, adding that this likely impacted sales of fast-moving consumer goods (FMCG) in the second quarter, with overall growth of just 2.7%. Vietnamese continued to rank job security (46%, up 3% against the previous quarter) and health (42%, up 1%) as their top two concerns, while 22% of the survey respondents indicated that the nation’s economic status (22%, down 1%) and their work-life balance (22%, down 1%) were their third greatest concern. Despite the country’s positive economic performance, slowdown sentiments among Vietnamese consumers continued to remain high, as 48% of respondents stated that the nation is still experiencing a slowdown. However, nearly five in ten respondents felt positive that the country would grow out of the economic woes in the next 12 months (46% compared with 38% in the first quarter). 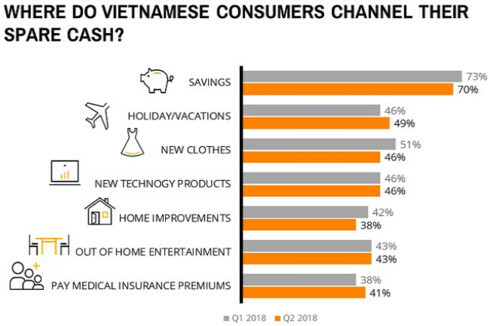 Moreover, Vietnamese consumers continue to feel upbeat over the state of their personal finances, with 76% perceiving it as good or excellent for the next 12 months, down 1% compared with the first quarter, but nearly half of respondents stated that this was not a good time to make purchases. 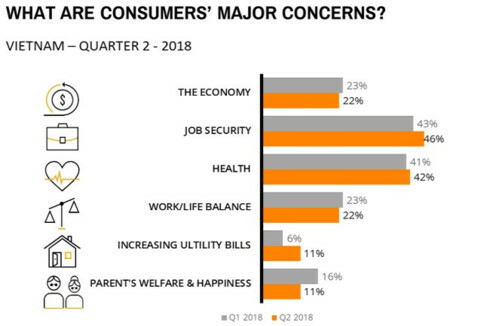 Other key areas of concern were increasing utility bills (11%), parents’ welfare and happiness (11%) and children’s education and/or welfare (8%). 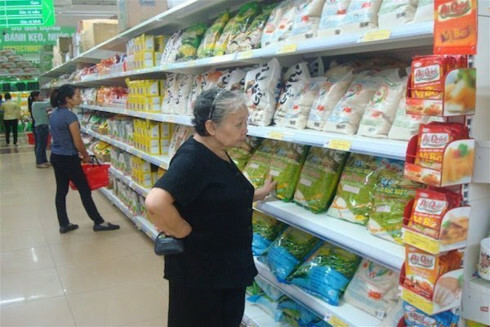 Managing Director Quynh said that the Vietnamese economy’s performance had gained momentum over the last three quarters, with gross domestic product growing at some 6-7%, yet the top concerns for Vietnamese consumers remained the stability of their jobs and the economy. Globally, Southeast Asian consumers have been leading the way in terms of savings for the past two years. In the second quarter, Filipinos ranked as the world’s most avid savers (71%), followed by Vietnamese (70%), Singaporeans (69%) and Indonesians (66%). The global average of consumers putting their spare cash into savings is 53% (up 1% compared with the previous quarter). However, after covering essential living expenses, Vietnamese consumers are eager to spend on big-ticket items as they wish to improve their quality of life. Nearly half of consumers were willing to spend on holidays (49%), and this desire grew gradually over the past year. Some 46% of Vietnamese consumers would like to spend their spare cash on new clothes and new technology products. Besides this, 43% wanted to divert any spare cash toward out-of-home entertainment activities, and 38% wanted to spend on home improvements and decor. More noticeably, spending on medical insurant premiums keeps increasing with this intention gaining three points in this quarter (41%, up 3% against quarter one).